Happy 40th Birthday, Woodsy Owl! Give a hoot—and a holler—for Woodsy Owl! Today’s his birthday. Or at least it’s the 40th anniversary of the press conference announcing Woodsy’s arrival. And that’s close enough for us. We won’t bore you with the details of how he came to be. You can learn that at this blog post. Instead, we’ll share the original September 15, 1971 news announcement of his arrival below. Click to read PDF of full press release announcing Woodsy Owl's debut. Let the festivities begin! You might start by putting on your Woodsy t-shirt to go out and throw your Woodsy flying disc. Don’t have one, you say? You can order them here. In his honor, please throw birdseed instead of confetti. We wouldn’t want to litter on the Little Guy’s birthday. This past weekend the New York Times reported the passing of Harold Bell on December 4 at age 90. Mr. Bell was one of the creators of Woodsy Owl, the Forest Service’s anti-pollution mascot. He was working with agency employees Glenn Kovar, Betty Conrad Hite, and Charles Williams (who gave Woodsy his slogan “Give a Hoot — Don’t Pollute!”) on the television show “Lassie.” Mr. Bell was there in his capacity as a marketing agent, the others as technical advisers (since Lassie “belonged” to Forest Ranger Cory Stuart), when the Forest Service asked them to develop a new mascot to fight pollution. A self-taught cartoonist, Mr. Bell did the first drawings of Woodsy. It was the late 1960s, when the environmental movement and concern for the earth were taking off. Newspaper editors were technically breaking a law by using Smokey Bear in media campaigns against pollution. (Federal law restricts Smokey to discussing firefighting issues. Woodsy has greater latitude. In addition to advising against littering, he has for several years been encouraging folks to “Lend a hand, care for the land” by planting trees and other activities.) The Forest Service developed Woodsy in part to get involved in the burgeoning environmental movement. Though created in time for the first Earth Day in 1970, he wasn’t formally introduced until September 15, 1971. Congress passed legislation protecting Woodsy’s image and establishing his licensing requirements in 1974. Funds from licensing agreements went to promoting education about conservation and fighting pollution. As we approach the fortieth birthday of the friendly owl, and given Woodsy’s message and the Forest Service’s emphasis on land restoration and conservation these days, it seems like the perfect time for Woodsy to make a return to the spotlight. Woodsy and Smokey had another thing in common — Rudy Wendelin served as the lead artist for both characters. 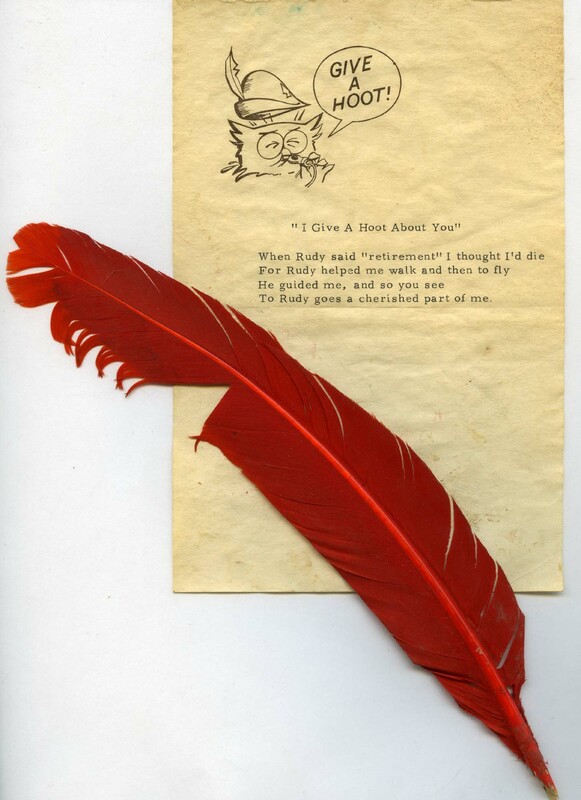 Complementing the materials in the U.S. Forest Service History Collection on Woodsy, which include education kits and a memo from 1988 debating whether to transfer or terminate the Woodsy program, the Wendelin collection has lots of cool Woodsy material. Rudy was brought in fairly early on in the development process to help bring Woodsy to life. 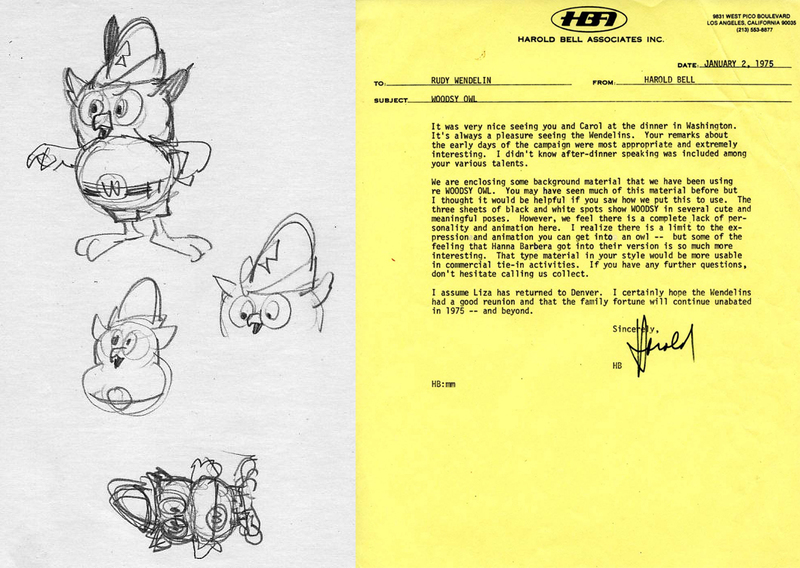 Below are just three of the items: original artwork of Woodsy by Rudy, a January 1975 letter from Harold Bell to Rudy requesting Rudy’s help in giving Woodsy more “personality” in his face, and a thank-you note to Rudy with a feather from Woodsy. Told you it was cool stuff!